Eureka, CA: After Eureka Police shot and killed 22 year-old Tommy McClain in cold blood in his front yard on September 17, 2014, Eureka Police Chief Andy Mills created a “Community Shooting Review Board.” This Board is the Eureka Chief's public relations attempt to pacify public outrage, subvert any real community oversight and participation, and perpetuate the farce of independent investigation and transparency. Alan Blueford, an 18-year-old African American student from Skyline High School, was shot and killed by Oakland Police Officer Miguel Masso on May 6, 2012. The Blueford family and JAB coalition strongly condemn the DA’s report and reject all attempts to cover up their son's murder. We demand Masso be fired and prosecuted, and all racial profiling practices, including stop and frisk, be stopped immediately! The Blueford Family and the Justice 4 Alan Blueford Coalition wish to extend a special invitation to all families who have been victimized or lost a loved one to police brutality. Please march together with the Bluefords and our communities to show our resistance and to say NO to this illegal and reprehensible violence from law enforcement. This march will occur on Saturday, November 10, at Noon, starting at 14th & Broadway, Oscar Grant Plaza, in downtown Oakland (12th/14th St BART). We will rally and march including a brief stop at the Oakland Police Department Headquarters, returning back to Oscar Grant Plaza for a gathering (~ 1.5 mi). Chris Burgess was well-loved by many in the community, WAS NOT VIOLENT, and had been thrown into the juvenile "injustice" system when he was very young. ZACHARY: Remembered and Loved by many! 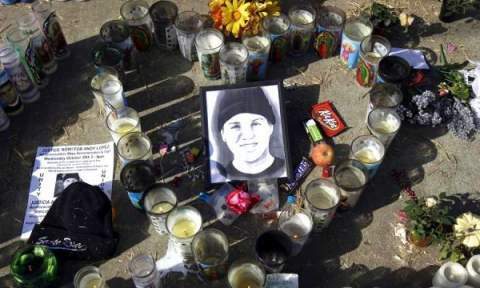 On January 4, 2007, Eureka Police officer Terry Liles shot Zachary 16 times, killing him. Zachary had just turned eighteen years old. Zachary left behind many friends and family who adored him. Liles continues to be a Eureka Police Officer, now a detective. Liles has continued his terror, harassing Zachary's young relatives and friends. Recently released footage from a police cruiser's dashboard camera shows the events leading up to the fatal shooting of a partially deaf man by a Seattle police officer. John T. Williams, a Native American wood carver who was partially deaf, was killed on August 30th after walking past Officer Ian Birk, 27, on the street with a knife in his hand. The Second Appellate District Court held that officer names sought in connection with shootings cannot be withheld under the California Public Records Act. The opinion, to be published can be read at: http://www.courtinfo.ca.gov/opinions/documents/B231245.PDF or in the attached document. Stand Up to the Watchdogs of the 1%--Your Local Police Department! Please note that the Civil Trial, Siehna Cotton and Martin Cotton I v. Eureka Police Department and Humboldt County Sheriff's Department has been postponed beyond January 10, 2011. The new date has yet to be set by the Court. Happy to report that I receive phone calls today from 2 different high schools teachers to set up 15 hr internships for their students at Idriss Stelley Foundation, prompted by the Mehserle Verdict and the police assassination of Derrick Jones. Our internship includes Youth Know your Rights interactive training so that the kids can later conduct their own workshops in their schools. Click HERE to see the STOLEN LIVES report from M. Gloria Hernandez of Fresno. The key to the acronyms used in the list are at the bottom of the document. Please encourage the family to request an independent autopsy and for the body to be PRESERVED. When the system tells a grieving family that they have 'this' many days to cremate or bury, the grieving family usually does it quick and has to rally together the money to pay for it. PLEASE tell them that they are entitled, if they request and notice the coroner, to an independent forensics testing (not sure how to pay for it, but it would be a forensic pathologist that the family chooses) and that should halt the "destruction" of Daniel's body. Redwood Curtain CopWatch Note: Albert Leday Sr. is the 21st person killed by cops (officially admitted) in Santa Rosa since 1999.